Poha – One Half Indian. I was totally a poha hater the first time I saw it. Poha is basically just rice flakes, but to me they look a lot like instant potato flakes. I was expecting the poha to turn into the mashed potatoes of my nightmares, but it didn’t. It’s delicious. My husband at this for breakfast in India, but I really find it to be more of a lunch/dinner/snack kind of thing. I’m kind of an eggs-bacon-toast or just-a-coffee sort of breakfast eater. I don’t really branch out much. This recipe is my husband’s. He was kind enough to teach it to me even though we both know that culinary lessons end up in a fight in our house. I don’t know why. We are just a couple of hangry animals around here I guess. Note: If you’ve never bought poha before (like me), your local Indian market has got it. Sometimes it is called chevda. 1. Heat your oil in a deep skillet. When oil is hot, fry potatoes until golden brown. Remove potatoes and season with salt and black pepper. Leave oil in pan. 2. Place the poha in a strainer and rinse thoroughly with water. Let sit for 5 minutes. 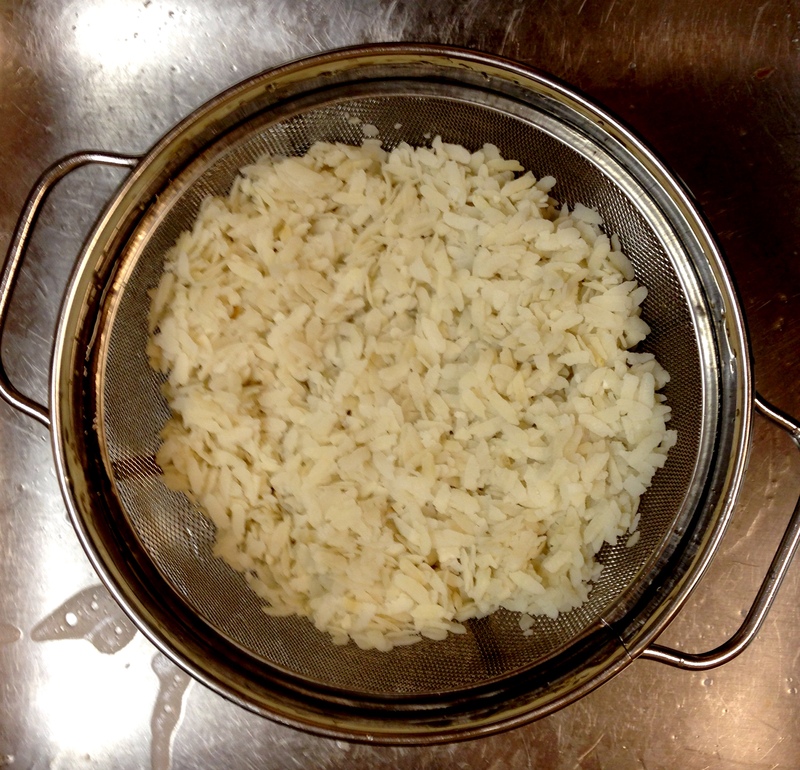 Then toss the poha around in the strainer and rinse thoroughly with water again. Let the poha sit for another 5 minutes. If you take a grain of the soaked poha, it should not easily disintegrate or feel too grainy. 3. In same pan/oil that potatoes were cooked in, place mustard seeds in hot oil. Let the seeds crack (you may want to cover the pan with a plate for this). Add the curry leaves, chiles, and onion. 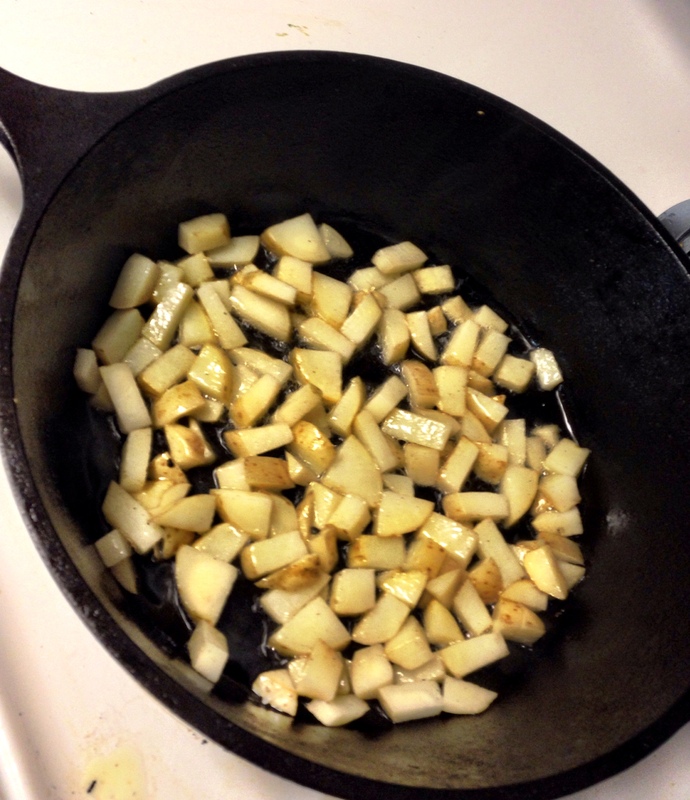 Let cook on medium heat until onion is soft and just begins to brown on the edges. 4. Toss soaked poha once more in the strainer to fluff up. 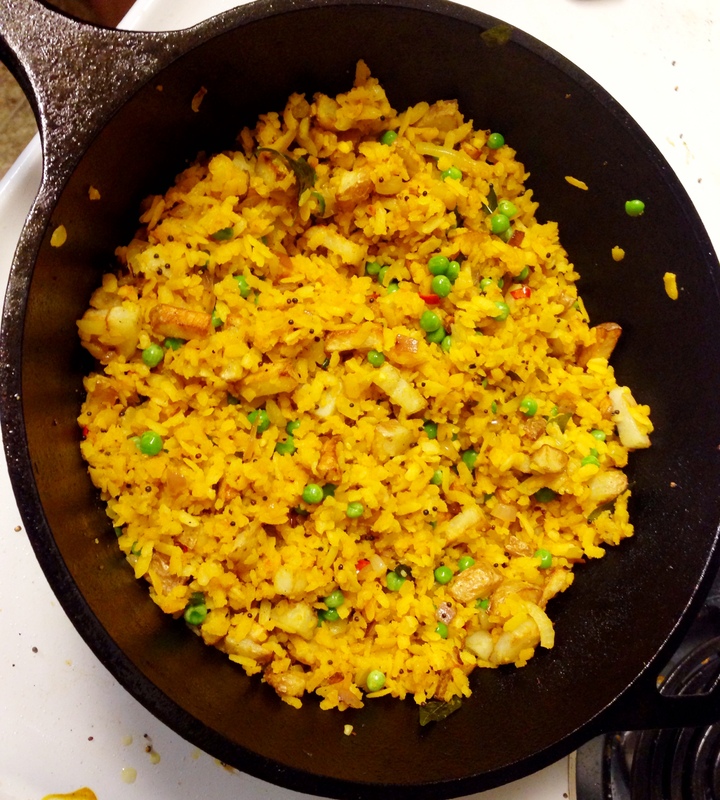 Dump poha into the skillet with onion mixture. Spread the poha out gently so that as much poha as possible is in contact with the bottom of the pan. Let poha sit undisturbed for 1-2 minutes. This gives a bit of crust on the bottom. 5. Add turmeric, cayenne, salt, and black pepper to poha and gently stir the ingredients and spices together. Place a lid on the poha and let it cook undisturbed on medium heat for 3-4 minutes. 6. After 3-4 minutes, remove lid and add cooked potatoes, frozen peas, and sugar. Gently mix ingredients together. Turn the heat off but leave the skillet on the stove. Cover skillet and let it sit on the stove for 5 minutes. This will finish cooking the peas and help get a bit of crust on the bottom of the poha. 7. 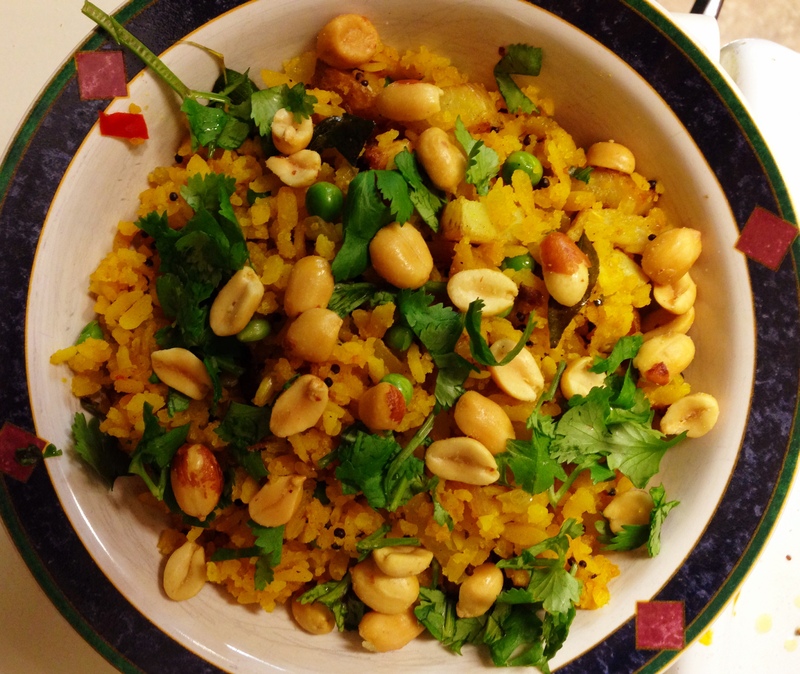 Serve cooked poha garnished with cilantro and peanuts. I like to eat mine with a dollop of yogurt as well.